Meet Emma. SHE'S co-founder of Firelight Camps in Ithaca, NY. She is also culinary director, food programmer, food product developer, merchandiser and marketer, ADVENTURER, mother, fire-maker AND AMONGST OTHER THINGS, AN AMAZING chef. 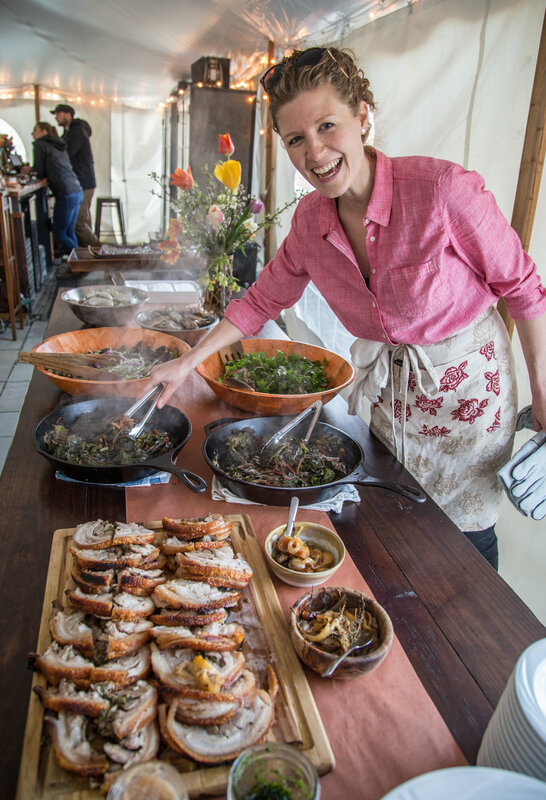 FInd out how her passions all CAME TOGETHER IN HER NEW OUTdOOR COOKBOOK, FEAST BY FIRELIGHT. MK: Was camping and cooking a part of your childhood? Emma: Growing up, my mother rarely let us watch T.V. When we weren’t romping around in the woods behind our house, she would take me and my three siblings hiking on weekends and family holidays. Inevitably a picnic was involved, and it was sure to be something delicious made with ingredients from her garden. She also had a way of adding simple elegance to the picnic table (or blanket). There was more than one occasion en route to the trail when my mom would pull over the car and whip out her pruning shears from the glove compartment to cut a bouquet of honeysuckle from the side of the road, her curls tangled in the bushes. My siblings and I would duck down in our seats, mortified. Of course, the resulting flowers, stuffed in a mason jar with water, added a beautiful touch to our meal and gave off an irresistible perfume that still stops me in my tracks today. While we spent a lot of time outside, camping was not a regular activity. However, I truly unlocked my passion for the outdoors during a few pivotal overnight trips with Mountain Workshop summer camp in Connecticut. My mother was raised in England and Italy, and identifies most strongly with her Italian heritage. As you can imagine, with an Italian mother, cooking was such an integral part of my upbringing that I really can’t even remember the first time I cooked. I was attached to my mom at the hip, and since she was always in the kitchen or the garden, I learned everything by osmosis. MK: What was your first solo camping trip like as an adult? Do you remember any cooking details from that experience? Emma: My first solo adult camping trip was almost certainly at a jam-band festival. I remember being impressed with the range of food people were cooking, and the effort to which they had gone to bring quality ingredients. Of course, it’s much easier to be prepared when you’re car camping, and yet that is how the grand majority of people camp in our country. My second adult camping trip was my introductory training weekend as a backcountry guide in college. On this trip, I had quite the opposite experience with food. I was disappointed to find lots of processed and packaged foods on the menu, and remember thinking that there must be a way to improve the quality of our meals, even when backpacking. After all: it seemed real food went hand-in-hand with getting back to nature, the source of who we are and what we eat. As our training progressed, I began to swap a few packaged items for select fresh items, or took the time to prepare homemade granola bars and other trail snacks before heading out for the weekend. On one trip, our group leader made morning biscuits from scratch, which was a revelation and completely inspiring to me! MK: What is your cooking philosophy? Emma: My cooking philosophy is fairly straightforward: source locally and sustainably, and cook simply. Don’t put too much pressure on yourself to “get it right.” When cooking, we have the opportunity to be present, tactile, and creative, so free yourself in the kitchen, both indoors or out! MK: How did Firelight Camps come about? And what do you want people to know most about glamping? Emma: My husband and I, Robert Frisch, co-founded Firelight Camps in 2014 in Ithaca, New York. 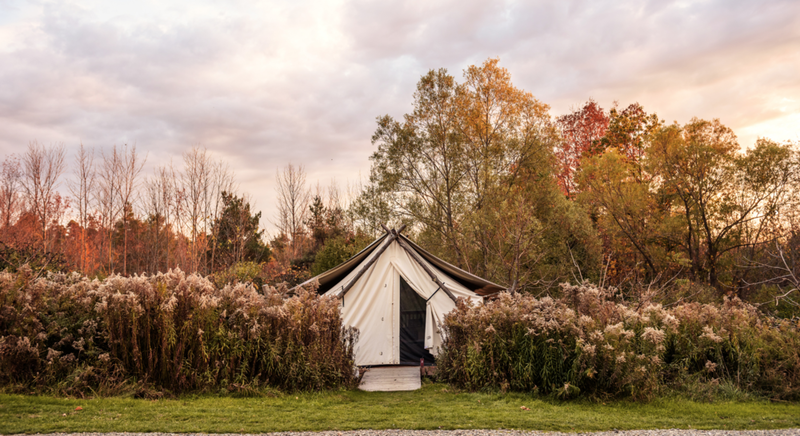 Firelight Camps, and the glamping industry as a whole, has created an accessible way for people to experience the peaceful and revitalizing effects of being immersed in nature. As a result, we’ve seen so many people step (slightly) outside of their comfort zones, often at the beckoning of a camp-enthused partner or friend, and sleep in a tent without sacrificing modern creature comforts like a plush bed, hot showers, and full bar service. This is usually all it takes for someone to rekindle their love for the outdoors with unabashed, childlike wonder. I also think that glamping can be misunderstood, because many people in the U.S. still aren’t familiar with the concept, whereas in the U.K. and Australia, glamping is well established and a familiar alternative to lodging and/or camping. However, the fact remains that its origins predate us, spanning from nomadic tribes to early pioneers and the great camps of past presidents and army generals. Perhaps the most well-established form of glamping is African safari. So, in a sense, we are in the midst of a revival that honors an ancient tradition in the outdoor world! MK: You also have a new cookbook coming out! What was your inspiration for writing Feast by Firelight? Emma: Yes! I’m so excited! This has been a long-time dream. I must have written at least ten cookbook proposals over the past seven years since I started my food blog. It wasn’t until launching Firelight Camps that I was able to bring my passion for food, community, and the great outdoors under one tent. When we started Firelight Camps, we were so focused on the quality of our guests’ experiences that our own meals often took a back seat. One night after a long day, I squeezed in around the campfire and lay an iron grate over the coals. I pulled lightly seasoned skirt steak from a ziplock bag and placed it on the grill, surrounding it with summer vegetables. I shifted the food with tongs until the meat caramelized and the peppers blistered. I then transferred the steak to a wooden cutting board, sliced it, and spooned pungent salsa verde over the top. Just then, Bobby joined me. We clinked our forks and tucked in to our simple meal. I looked up from my plate because the crowd had gone silent. I felt compelled to share our meal with the others gathered around the flames. I sliced our food into bite-size pieces and passed them around, listing the ingredients in my mamma’s salsa verde. This is how Feast by Firelight was born, and what this book is all about: quick outdoor meals meant to be shared with family and friends, old and new. MK: What does your messkit and pantry look like for your weekend camping trips? Emma: Ah, you will have to get your hands on a copy of Feast by Firelight to answer this question! I try not to make specific brand recommendations for gear, but describe in detail my preferences for setting up a minimalist and easy outdoor kitchen. In my cookbook, I encourage campers to pare down their messkit and pantry even more, based on the recipes that they’re planning to cook on their trip. I also provide instructions on how to build a campfire, how to pack the cooler, and I offer five sample menu planners. MK: What is it about cooking over an open fire that draws you in? Emma: There is nothing quite as primal as cooking over an open fire. The very act of building the fire is a time-honored ceremony. Preparing food over the fire demands that we activate all of our senses, making us feel alive and empowered, and the taste of woodsmoke awakens an ancient knowing inside of us. What’s more, cooking over an open fire nearly always requires the help of extra hands, and most certainly a tribe to share the meal. And so, perhaps above all, I love the sense of community that transpires when the campfire becomes our kitchen and dining room. In this sacred space, we unravel and unplug. We connect with ourselves, each other, and the natural world around us in a way that’s rarely afforded in our daily, modern lives. MK: Any advice you would give to people who are just starting out cooking over an open fire or using cast iron? Emma: Using cast-iron cookware can feel intimidating. As cast iron has been replaced with modern cookware, we’ve lost access to knowledge about cast-iron use and care in our immediate circles and families. Once upon a time, this wisdom was handed down between generations. I was fortunate that my mother gave me my first cast iron, and spent a year teaching me how to use it before I went to college. Of course, it didn’t take a year to learn, but it gave me plenty of time to practice seasoning my pan, rescuing it from burned bits or rust, and learning how to store it. The good news for those wanting to learn how to use cast iron is that there are loads of forums, blogs, and other resources on the topic. Personally, I found all of this information a bit scattered, so I created an e-booklet, Tender Lovin’ Cast Iron Cooking & Care, which includes three recipes to get you started, and five reasons why cast iron truly is the best cookware. Emma: All of the above! I suppose, if I really had to choose, sweet. I have some form of dessert after breakfast, lunch, and dinner. The caveat is that I prefer natural sweeteners like honey, maple syrup, and naturally-sweet fruit. MK: What is your favorite way to make coffee outside? Emma: Pour over. There’s also a recipe for Cardamom-Mint Turkish Coffee in Feast by Firelight. MK: What are some of the challenges/rewards you face camping with your young daughter? What do you hope to impart to her about food and the outdoors? Emma: For the first year of my daughter’s life, we took her hiking nearly every day in the wilderness preserve behind our house. By the time she turned two, she’d been “glamping” a handful of times at our hotel, Firelight Camps. This wasn’t exactly how I envisioned launching her into the camping world, yet it’s been an incredibly hassle-free way to introduce her to camping while familiarizing myself with camping as a family. Our biggest challenge is always sleep, since we’re at the whim of the sun and the moon, and the animals tend to wake her up at night – which, let’s be honest, only affects the tired parents. Ayla has a ball outside! From May to October, she spends loads of time around the campfire with us and our guests, and she explores the trails behind Firelight, where I’ve been introducing her to the most identifiable wild edibles. She can point out blackberry brambles in the winter from their purple stems! We often cook over the campfire or grill and eat outside together. As a working mom and entrepreneur, I feel so grateful that we’ve created an environment where our daughter feels comfortable exploring outside at such a young age. During the off-season, we try not to let the snow and short days stop us by getting outside as much as possible. Emma: The lessons are countless. Though not an outdoor adventure, I’ll share a lesson from one of the most intense and formative adventures of my life, Food Network Star. As a self-taught chef, I had always struggled with feeling like I wasn’t really a chef. Before going on the show, I studied the Culinary Institute of America’s textbook and tried to learn new techniques I’d never used before. But as soon as I was on the show, something became so evident to me. Every single person, chef or not, has a unique genetic and cultural makeup when it comes to food. We are influenced by so many layers, beginning with the foodways of our family unit, and expanding to those of our relatives and friends. Other layers we learn from media or classes, inspiration we draw from travel, and ingredients or methods we become fixated on. The world of food is so vast that it is impossible to master everything – but individually, we are all masters of something. Ultimately, for me it wasn’t really about being a trained chef or not; it was about valuing my own life experience and beliefs, and not being afraid to share them with the world. This is why I am so excited about Feast by Firelight, which is as dear and near to my heart as it gets. MK: What are you most excited about for the upcoming year? Emma: It’s funny: our daughter Ayla was born just before I got the deal for this cookbook - essentially, when it was first birthed! Now, as the book is launched to the public, I’m preparing to birth our second baby in early September. This is undoubtedly what I’m most excited about in the upcoming year. Ayla showed me that there is nothing more important than being a mother; she has been the greatest gift in our lives, and my purpose in this world has never been more clear and pure. MK: Congratulations! Many thanks Emma, and good luck on your many adventures that lie ahead. Get in the messkitchen and check out a few recipes from Emma's cookbook Feast by Firelight like FIRE-LICKED SKIRT STEAK WITH MAMMA'S SALSA VERDE, SKILLET BISCUITS WITH EVERYTHING SPICE as well as GRILLED ASPARAGUS WITH HONEY MUSTARD DRESSING AND SHAVED PARMESAN. Photos and recipes reprinted with permission from Feast by Firelight, text and illustrations copyright ©2018 by Emma Frisch. Published by Ten Speed Press, an imprint of Penguin Random House LLC.